Daedalus – Mortal craftsman, possibly son of Metion and Alcippe, father of Icarus. Legendary craftsman, designer of the Labyrinth and first man to fly. Danaans - Greek people, descendants of Danaus, synonymous with Achaeans and Argives. Danae - Mortal princess, daughter of Acrisius and Eurydice, lover of Zeus, mother of Perseus. Princess of Argos. Danaids - Mortal princesses, 50 daughters of King Danaus by various wives, including Hypermnestra. Danaus - Mortal King, son of Belus and Anchinoe, brother of Aegyptus, father of the 50 Danaids. King of Libya and Argos. Daphne - Naiad daughter of Ladon, beloved by Apollo. Dardanus - Mortal son of Zeus and the Pleiad Electra. Founding King of Dardania and ancestor of the line of Troy. Deianira - Mortal princess, daughter of Oeneus and Althaea, sister of Meleager, wife of Heracles. Deidamia – Mortal princess, daughter of Lycomedes, lover of Achilles, and mother of Neoptolemus. Later married to Helenus. ​Demeter - Olympian goddess, daughter of Cronus and Rhea, mother of Persephone. Greek goddess of Agriculture. Despoena - Olympian era goddess, daughter of Poseidon and Demeter. Greek fertility goddess. Deucalion (i) – Mortal king, son of Prometheus and Pronoia, husband of Pyrrha. Survivor of the Great Flood, and mythical ancestor of most Greeks. Deucalion (ii) – Greek hero, son of Minos and Pasiphae, father of Idomeneus and Crete. Argonaut and Calydonian Hunter. 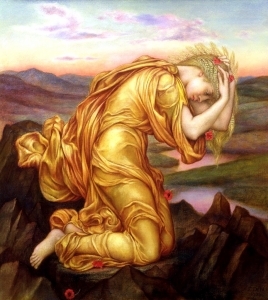 Dione (i) -Alternate name of the Titan goddess Phoebe, thus daughter of Ouranos and Gaia, closely associated with the Oracle at Dodona. Dione (ii) – Oceanid Nymph, daughter of Oceanus and Tethys, occasionally named wife of Zeus. Dione (iii) – Hyades Nymph, daughter of Atlas and the Oceanid Pleione, wife of Tantalus, mother of Pelops, Broteas and Niobe. Dione (iv) – Naiad Nymph, daughter of Nereus and Doris. Dionysus – Olympian god, son of Zeus and Semele, husband of Ariadne. Greek god of Wine. Dodona - Oceanid daughter of Oceanus and Tethys, with the settlement of Dodona possibly named after her. Doris – Oceanid daughter of Oceanus and Tethys. Wife of Nereus, and mother to the Nereids. Dysis - Horai goddess, daughter of Helios. Horai associated with the sunset. Dysnomia – Daughter of Eris. Greek goddess of Lawlessness.